Here is Some Information about Vaishno Devi Temple in Katra Jammu Kashmir India. Aarti Timings:6 am to 8 am and 6 pm to 8 pm. 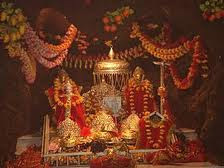 Best Time to Visit :One Can visit Vaishno Devi temple at any time of the year, but avoid planning Vaishno Devi tours in winter season as it is extremely tough due to the excessive snowfall. Vaishno Devi Temple, one of the sacred Hindu shrines in India, is situated at an elevation of 1700 metre on top of the Trikuta Hills, Katra. Jammu is located at a distance of around 46 km from the town of Katra. 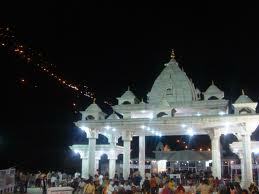 The temple consists of a cave shrine dedicated to the Hindu Mother Goddess, Vaishno Devi. The cave measures approximately 30 m in length and 1.5 m in height. According to popular folklore, the cave was used by the Mother Goddess to hide from a demon that she eventually killed.The main attractions of the shrine are the idols depicting the 3 forms of Vaishno Devi, namely Mahakali; the Hindu goddess of time and death, Mahasaraswati; the Hindu goddess of knowledge, and Mahalakshmi, the Hindu goddess of wealth and fortune. 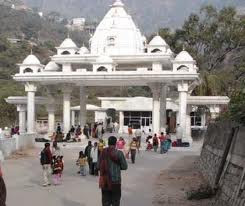 The Shri Mata Vaishno Devi Shrine Board has been assigned the responsibility of maintaining this temple.Approximately 8 million devotees from around the country visit the Vaishno Devi Temple on an annual basis. This figure makes this shrine the second most visited temple in the country after the Tirumala Venkateswara Temple of Andhra Pradesh. 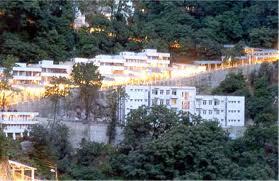 Vaishno Devi is considered to be the incarnation of Goddess Saraswati, Goddess Lakshmi and Goddess Kali. 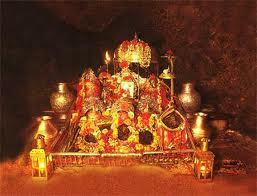 The main reason of birth of Vaishno Devi was the destruction of Demon Mahishasura. The divine girl was born to a man called Ratnakar who named her Vaishnavi. She was brighter than all other children of her age, in fact, at a young age itself, she acquired more knowledge than many famous scholars. She renounced all worldly ties and went into deep jungles for meditating. She used to worship Lord Vishnu and on directions of Lord Rama, she built an ashram for meditating. Soon, a man called Bhairon Nath came to know about her and when he saw her, he was smitten by her beauty and grace. He started to pester her to marry him. Vaishnavi decided to run away to jungles to evade him. After long time of this hide and seek, she confronted him on the entrance of a cave and beheaded him. Bhairon Nath after death realized his mistake and prayed for forgiveness. He was forgiven by the Goddess and was blessed that every devotee who comes to worship her will also have to visit the temple of Bhairon Nath without which their pilgrimage will be incomplete. Vaishnavi then left her human body and become a rock statue and went into meditation. It is unfathomable for a normal human being to ascertain that when exactly the pilgrimage has started to the Holy Cave. 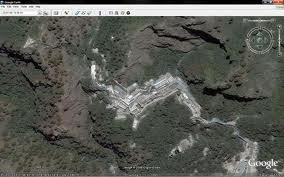 According to a geological survey, the Holy Cave of Mata Vaishno Devi indicated its age to be nearly a million years, but at the same time there is no proofs found in any hindu mythological books like Vedas & Purans. During the time of Mahabharat war at Kurukshetra, Pandavas sought blessings from Goddess for their victory, Arjun addresses the Mother Goddess as “Jambookatak Chityaishu Nityam Sannihitalaye”, It means “you have always dwell in the temple on the slope of the mountain in Jamboo” probably Jamboo refers to the Jammu city of present day. It is also believed that the temples of Kol Kandoli and Bhavan has been built by Pandavas. There are five stone structures on a mountain just adjacent to Trikut Mountain and also overlooking to Holy Cave of Mata Vaishno Devi, It is believe that those structures are the symbols of Pandavas. The tenth guru for Shikhs Guru Govind Singh ji also visited Holy Cave via Purmandal, it is also one of the oldest reference. While proceeding towards the entrance pilgrims can see a cave mouth on their right hand side, this is the original cave leading to the Holy Pindies, now it is closed due to narrowness of the cave, it takes too much time to proceed towards the Pindies. The new tunnel has constructed to facilitate maximum number of pilgrims, as there are 15000 pilgrims visit per day for Darshan of the Holy Cave. Mostly in winters and lean yatra periods, when the number of pilgrims visiting the holy shrine is at minimum, the original cave is opened for the entry. Passing through this cave is a different experience altogether. The ancient Holy-Cave is popularly known as Sunder Guha. The mouth of the cave is so narrow that a single person can entere at a time by crawling. Earlier there was no electric light inside the cave and pilgrims has to face many difficulties. Now the entry to this cave through the ancient mouth is prohibited and the new tunnel has been used instead. After crossing this portion the pilgrims walks further through a corridor on which numerous bells are hanged, after that pilgrims reaches a broad platform where few statues of Lions have been displayed. A big idol of the great goddess mother is also enshrined, from here starts the new tunnel. Upon entering the tunnel one should observe silence and carefully move in the queue concentrating towards the left hand side where at the end of the tunnel is a raised marble platform on which the Divne Mother has revealed herself in the natural rock forms known as the Holy Pindies. The complete rock structure is covered under a white marble platform and only the topmost portion is visible for Darshan. These are three Pindies, denoting the three Supreme Energies of Creation, Maintenance and Dissolution.There are various other religious symbols outside and inside of the Holy Cave and around the Holy Pindies. 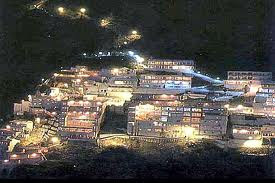 It has been believed that there are 33 crores of Gods & Goddesses are present inside the Holy Cave. 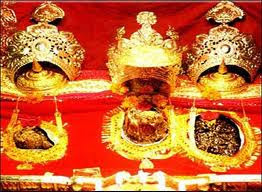 It is also believe that all gods and goddesses worshiped the Mata Vaishno Devi in this cave and they left there marked inside. It is also believe that during daily Pujan and Arati all gods and goddesses present inside the cave. By Bus :Through Jammu towards Srinagar National Highway No. 1A passes. From Jammu to Katra, taxi services are available that cost about Rs. 1500. At regular intervals, Jammu and Kashmir State Road Transport Corporation (J and K SRTC) buses run various buses from Jammu to Katra. State public buses from Jammu to Katra leave at a hiatus of 15 mins. From Jammu to Katra, private bus services provide the facility of deluxe buses. These buses charge about Rs. 300. From all major North Indian cities regulars bus services are accessible for Jammu as well as Katra. By Train:Just like the closest airport to Vaishno Devi was Jammu, similarly, the closest railway station to Vaishno Devi is also Jammu. Jammu and several parts of the country are connected to each other on broad gauge and many passenger trains. When it is the top of summer season and other vacations, Indian Railways introduce special trains for Jammu for the convenience of the travelers. Jammu railway station is linked to all the chief cities in India. The connection of this railway station with all the major cities in India includes Trivandrum Railway Station that is the southern most railway station of India. There are several superfast trains also that facilitate your journey. If you are fit enough to trek to Vaishno Devi, then trek up to the shrine from Katra or else take a palanquin or horse or pony or doli or palaki or a helicopter. 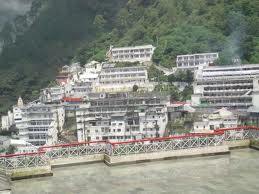 The above description must have guided you well in the direction of how to reach Vaishno Devi from your end. You can select the one that suits you the best and you can reach the place of great religious importance. 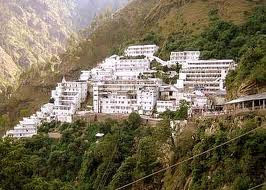 This vacation, plan a trip to Vaishno Devi keeping in mind how to avail the best of the given ways that will take you to Vaishno Devi.